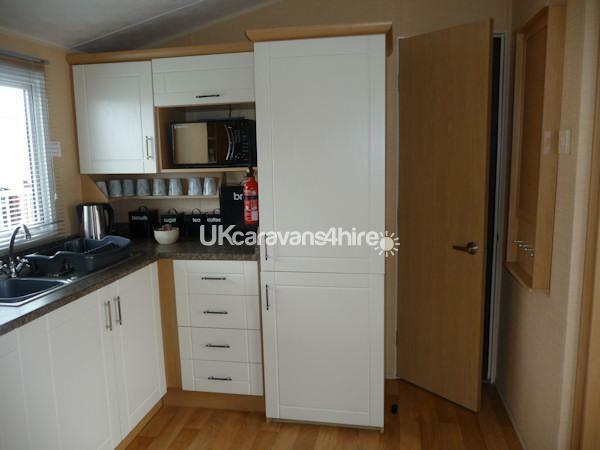 Luxury caravan, very spacious with comfortable lounge boasting lots of seating, all modern furnishings and the up-to-date kitchen area with lots of storage any everything you would need to prepare a light snack or family meal for 8. 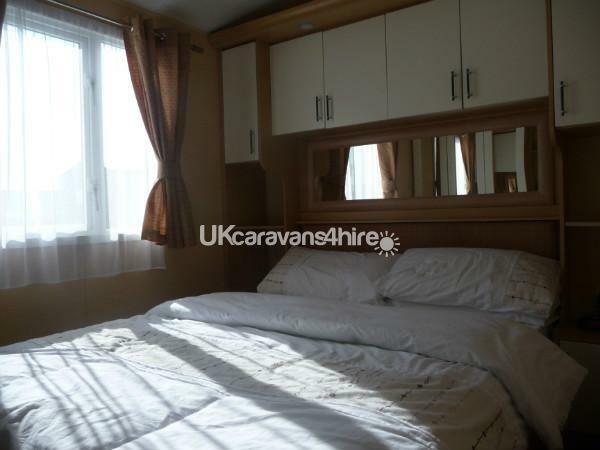 The caravan has 3 bedrooms (1 double and 2 twins, twin beds can be pushed together to make doubles if required) with amble space for clothes in the wardrobes and over bed units. TV to Master Bedroom. A sofa bed in the lounge will comfortably accommodate a further 2 people. All beds have quality mattress protectors, duvets and pillows. We don’t however provide the bed linen so please remember to bring your own as well as towels and tea towels. Moving onto the bathroom - this is a good size, with toilet, washbasin and large walk in shower. For added convenience, there is a large second toilet with washbasin. In the kitchen you will find a fridge freezer (Full Size, 60/40, which is great for storing both fresh and frozen food), oven/grill, microwave, kettle and 4 slice toaster. 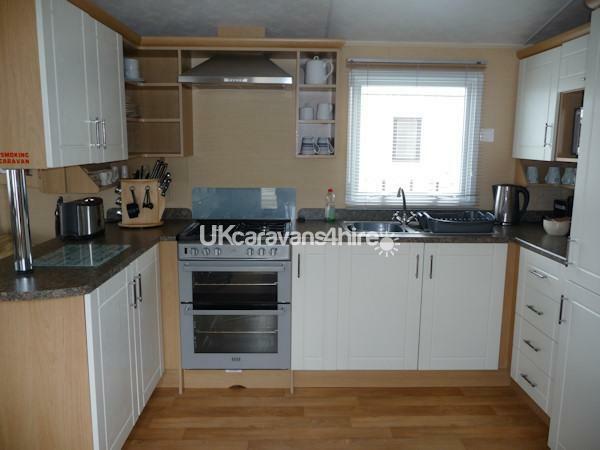 You should find our caravan well stocked of cookwear (pots, pans, casserole dishes, roasting dishes etc) crockery (plates, dishes, mugs, cups, tea pot, glasses etc) and cutlery. In the lounge you will find a 40inch LCD TV with Freeview and DVD player (with additional tv available in master bedroom) just in case you fancy a cosy night in. Outside there is a large veranda with gate. For those hot summer days, a patio set is provided on the veranda where you can dine or just relax in the sunshine. 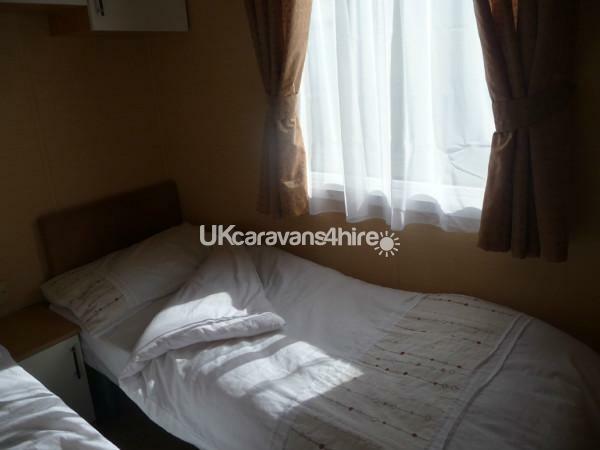 To the rear of the caravan you will find a storage shed where you can store bulky items such as pushchairs, suitcases, even bucket and spades or body boards. Should the weather be a little chilly outside this will be no problem. 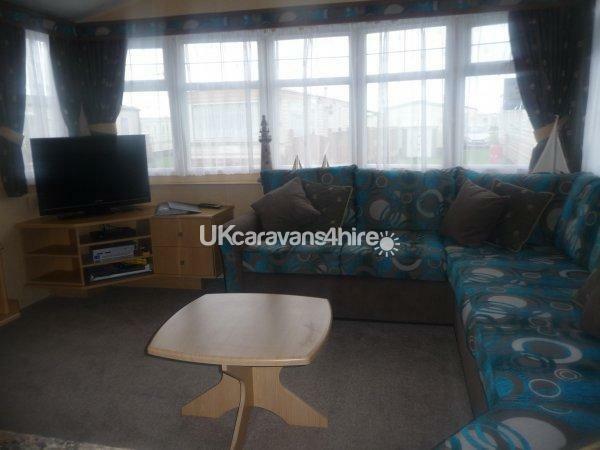 The caravan has gas central heating in every room and is fully double glazed. 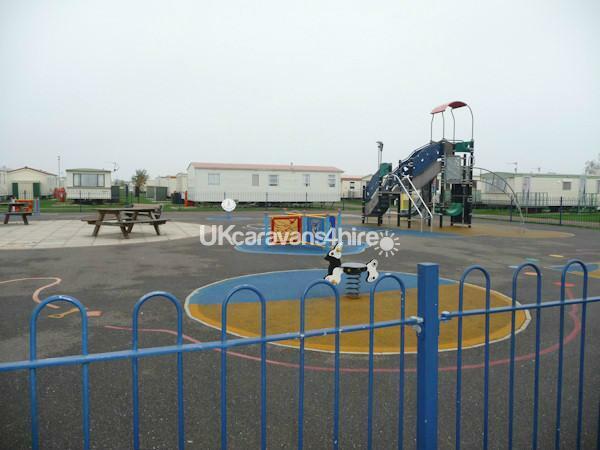 The caravan is pitched on 'Firs' area of Kingfisher Caravan Park, which is a very short walk from the park entrance. 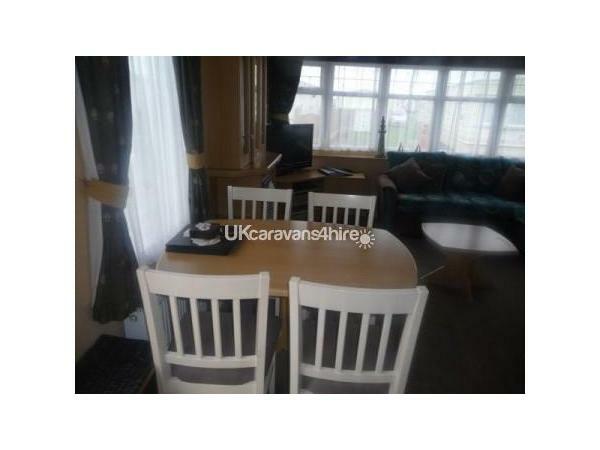 We have also provided in this caravan a highchair and travel cot. Bed Guard also available upon request. What I like about the Kingfisher Park is the 24 hour security it offers, CCTV and card operated vehicle barrier system (cards supplied when booking is confirmed. On site there is a launderette should you require one, a mini market for those daily essentials and a large children’s play area to keep the little ones entertained. Over on Kingfisher’s sister site, Coastfields Holiday Village, there is also an indoor swimming pool which has a water slide, splash and bubble pool. You will also find a large entertainment centre offering evening shows, kids club, restaurant, selection of takeaways. 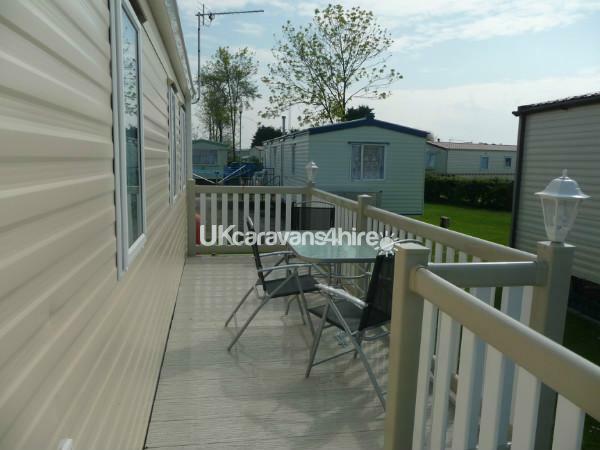 In close proximity to Kingfisher Caravan Park you will find Fantasy Island Theme Park and Europe’s largest 7 day outdoor market which really shouldn’t be missed. Here you will find a large selection of shops, pubs, takeaways and entertainment for both the young and old. Hardy's Animal Farm and Butlins Resort are only a 5 minute drive away. If it’s the beach or seafront walks you like, it can be reached by foot (10 minute walk) or take the free train over to Coastfields Holiday Village - Beach is just across the road!. Really, there is something for everyone here. Take a Ride on an Open Top Bus to Skegness. The kids really enjoy this, and there is more shopping, restaurants and bars to be found. There is also Pleasure Beach and Sea World attractions. A £100 non refundable deposit will secure your holiday dates. The balance is required 6 weeks prior to the start of your holiday, together with a £50 security bond (Security bond refunded following return of barrier card and caravan keys). We are now taking bookings for the 2016 season, book early to avoid disappointment!!! Want a short break – say 3 or 4 nights. Then email me for information on availability and price. Payment may be made by instalments if you wish.